For some strange reason I decided to take up golf at the age of forty-one. He knew whereof he spoke. My initial attempts at the game left many a chunky divot on the fine grasses of local courses. Scores of balls were lost in both natural and unnatural waters. 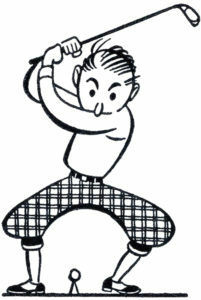 So frustrated was I that one day, after yet another shank, I hurled my five-iron like a German hammer thrower. It whirligigged through the air before settling into the leafy arms of a eucalyptus tree. It is there to this day. I took lessons, but it seemed like every time I tried to put something into practice my playing partners would run for cover. I was about to give up the game when I came across an intriguing sounding book. It was called The Inner Game of Golf by a fellow named W. Timothy Gallwey. The book made an astonishing claim. You could actually lower your golf score simply by mastering what goes on inside your noggin. You could learn to relax, perform under pressure, and make a repeatable swing. You could learn to get out of your own way, so you were not overthinking everything. The game would even become fun. I was ready for anything! So I spent several months working on my mental approach to golf. And you know what? I qualified for the U.S. Open and finished second! Oops. Sorry. That was a dream I had one night. What actually happened was that I got better. I really did. I reached a point where I knew I could go onto any course in the world and not embarrass myself (except in the way I normally do at large social gatherings). I bring this up because, like brother Brooks, I find a lot of analogies between sports (especially golf) and writing. And I believe the mental game of writing is every bit as important as typing and a good cup of java. There are so many ways a writer can feel beaten down. Rejection, envy, discouragement over sales, self-doubt. These mental land mines threaten your productivity and growth, which are the engines of your writing career. As someone who pursued the writing dream after being told you have to be “born” a writer; and as someone who has been making a living at it for twenty years; and as someone who has been through all of the slings and arrows of outrageous writing fortune — I finally decided to write a book about the mental game of writing. 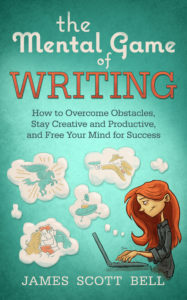 That’s why the title is, amazingly: The Mental Game of Writing: How to Overcome Obstacles, Stay Creative and Productive, and Free Your Mind for Success. The book covers everything from decisions, goals, courage, creativity, and growth to dealing with envy, stress, comparison, and burnout. It has chapters on increasing your joy, discipline, and production. There’s even a chapter filled with my favorite inspirational quotes from other writers. These can be a tremendous boost to you in time of need. That was enough to keep me going. I never looked back at those doubters again. That’s what I want you to have. Peace of mind because you took the steps you could to be the best writer you can be. It starts by going mental. So what are the major mental obstacles you’ve faced in your writing life? How did you overcome them?